Since Mombetsu joined with Newport as a sister city on April 8, 1966, active communication and exchanges have been pursued. Newport, located in Lincoln County, Oregon, U.S.A., is known as an excellent sightseeing place because of its rich nature. Today, active communication and exchanges continue and include mutual visits by goodwill missions, exchanges of students, participation in memorial ceremonies and events and the issuing of publications celebrating the relationship. 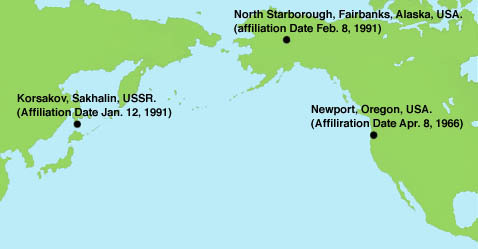 In 1987, Mombetsu joined with Fairbanks, Alaska in a private friendly city relationship. Fairbanks is known as the second-largest school city in Alaska, with seventeen research facilities including a state university. These private exchanges, which stressed culture and agriculture, proved fruitful and a sister-city relationship with Fairbanks was established on February 8, 1991, fulfilling the deepest wish of the people of Mombetsu. On january 12, 1991, Mombetsu joined with Korsakov, the city closest to Hokkaido in Sakhalin, U.S.S.R., as a sister city. Korsakov, which is the largest fishing port in Saghalien, has many characteristics in common with Mombetsu. Education and cultural exchanges are about to be promoted, and economic exchanges are expected for the near future. Based on exchanges with these three cities, Mombetsu will continue to deepen its friendships with the world and to grow as an international city.